The practice of flavor boosting is probably universal, and the Eastern Native Peoples had a particular taste in their choice of condiments. Fats and oils were coveted for their ability to turn bland tasting dishes into rich, flavorful fare - which was especially appreciated among the horticultural Native communities that consumed corn dishes almost daily. Mostly thought to be a Southern American cuisine style, adding fat to greens, corn breads, and succotash was first demonstrated by Eastern Native Americans. Bear's fat was especially prized for taste, and was used to "butter" corn cakes and added to hominy, succotash, wild rice, cooked greens, and corn mush. A favorite way to flavor venison was to skewer it, and dip it into bear oil and maple sugar before eating. Foods were predominantly boiled and roasted, however meats, vegetables, and breads were at times shallow fried in animal grease. Animal bones were cracked and cooked for their bone grease. Marrow, a fatty tissue ranging in color from pale to red, was found in larger bone cavities and was used to flavor foods. Sometimes Native folks enjoyed consuming the marrow as a tidbit on its own. An Ojibwa man said moose fat and deer tallow were mixed with dried blueberries, and while the infused blueberries may have been eaten as is, the fruit probably served to keep the grease from souring in storage. Some were noted to store their bear fat in vessels with sassafras and slippery elm bark "to keep it sweet." Tallow was also sometimes mixed into hot maple sugar just before it was cooled and granulated… this was said to “soften” the texture of the sugar (something this author has experienced to be very true). Besides acting as a cooking and flavoring agent, animal fat could even be enjoyed on its own. A Canadian Native person was observed biting into a piece of solid bear fat, in the same manner one might enjoy an apple. It is likely that many others enjoyed solid fat as a treat, or as even a dietary supplement of sorts, such as the way some infants were fed little amounts of pure oil. The author renders down deer fat, seen here step by step... From fresh cut deer fat (left) to bright white deer tallow from storage (right). Beaver tail, stone "grilled," the fat inside cooked to a custardy texture by the author. 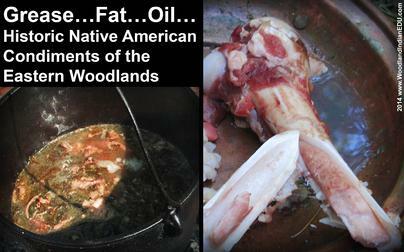 Bear, moose, and deer weren’t the only animals in which fats were procured from; many animals that were hunted provided oil. Birds like ducks and geese had a rich oil content which may have been taken advantage by some Native cooks. Passenger pigeons, once numerous but now extinct, were noted to render a good tasting fat for some Eastern Native folks. Likewise, oil procured from fish was utilized by some such as the Huron (Wandat), and not just for culinary applications. Like other oils, it was also used for cosmetic purposes in conditioning the skin and hair, as was noted among Cherokee women who were said to have wrapped their long locks in eel skins (technically freshwater lamprey), impregnating the hair with fine oil. And notably while the oil was deemed ok for cosmetic and medicinal use, the fish itself was considered not fit to eat in Cherokee society (cultural taboos). But the Delaware (Lenape) People did catch and eat eels (proper Atlantic variety of eel) during the annual eel run on the Delaware River. These eels were quite fatty... one 18th century Moravian missionary who lived among the Christian Delaware noted that frying the eel was like frying bacon. It is not known for sure whether the Delaware did render and keep fish oil for later use, but it was certainly possible (speaking of resources, technology, cultural tastes, taboos, etc.). Indeed, fish broth, which contained fish oil, was often added to corn-based dishes in many Eastern horticultural communities. Famously beaver tail was another fatty food noted to be cooked and consumed. 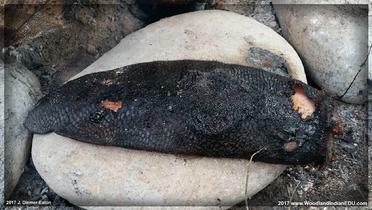 The flat tail, while it had some gristle, it was the cooked custardy fat inside the tail that was happily eaten (see photo of cooked beaver tail, above left). Not all oils were obtained from animals. Nuts were especially desired for their oily meats. Acorns (especially red oak acorns), butternuts, walnuts, and hickory nuts were cracked open and crushed (sometimes after being roasted in the shells) and then boiled in water to extract the oil. It was said that the nut oil would rise up and the cooks skimmed it off and saved it for many cooking and cosmetic applications. The Iroquois (Haudenosaunee) considered butternut and hickory nut oil to be a delicacy eaten with breads and mixed into puddings. Nut oils were among the oils fed to nursing infants. Sunflower oil was made in the same way as nut oils, and was said to be used in great quantities in Iroquois cuisine.